Container tomato Pinocchio Orange is a low growing, productive cherry tomato variety. 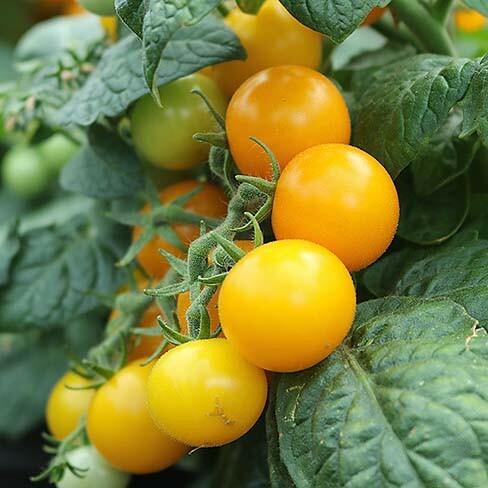 He stays small, but produces a very prolific amount of small, round tomatoes that ripen from green to gold-yellow to orange. The flavour of these tomatoes is delicious, juicy and a little bit unusual tasting but predominantly sweet. This variety is early ripening and can be harvested about 70 days after transplanting. Use them in pasta sauces, in salads, in soups, ketchup and as a snack straight from the vine. Give this plant a sturdy support and lots of sunshine and warmth. Tomatoes contain a lot of vitamin C and Lycopene. The body takes this in better when the tomatoes are heated. Non hardy annual. Height: 25 - 35 cm.